It’s safe to say that Mad Max: Fury Road has become a bit of a modern classic in the years since its 2015 cinema launch. Praised for its exhilarating action, humour, and narrative focus, its influence can of course be felt the most in the film industry, but videogames are also looking for a piece of the action. Mad Carnage is one title that is clearly inspired by the antics of Max Rockatansky, but with the neat twist of being a turn-based strategy game. So does this trip to the desert wasteland kick up a storm or die of starvation? The Great War has wiped out humanity as we know it, cutting off all worldwide communication and wiping out every form of power production and distribution. Some communities were formed in its aftermath, but as one settlement uncovers something that could explain their past and be the key to the future, in steps protagonist John Carnage to help them fulfil their quest. It’s a plot that has long been played out, but its execution and presentation is anything but. Half of the story is told through beautifully illustrated comic strips that detail the minute to minute action which occurs between missions, and then the other fraction comes in the form of huge walls of text that are incredibly boring to read through. You’re hit with one of these barricades less than five minutes into the game, and it’s a huge turn off because it takes far too read through it all. This creates a huge contrast in how you engage with the plot as the comic strips are fun to interact with and quick to read, while the walls of text are a slog to get through and bring the pace to a screeching halt. When it comes to gameplay, it’s all about the cars. 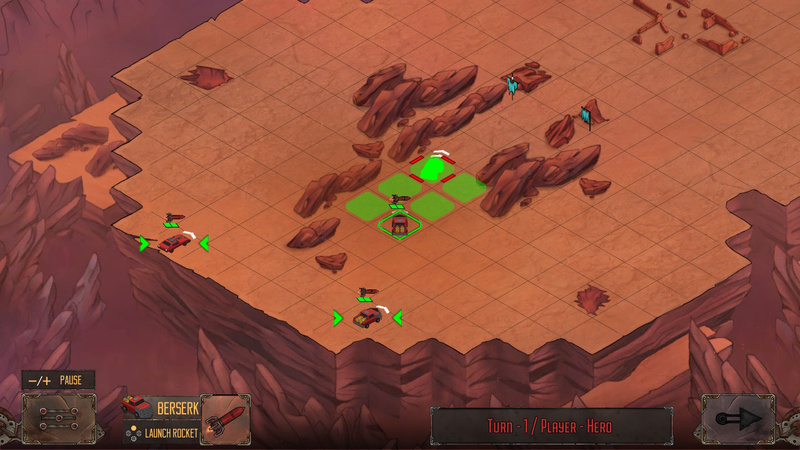 Action takes place on a square-based grid as you and your opponent take turns to eliminate each other with any potential complexity spawning from the movement mechanics. 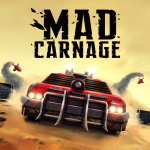 Cars in Mad Carnage operate on momentum, and it’s this that has the biggest effect on whereabouts on the grid you can move. If you only moved a few blocks forward in the previous turn, you have pretty much full control of your next move, including turning to the left or right. But, if you took a great stride in the last round and the game pictures you as speeding ahead, then you’ll need to take one turn to slow down, and then on the subsequent go you’ll have better control of your movement. This is both the most unique thing about the game and its biggest hindrance thanks to the complete lack of any tutorial that teaches you its intricacies and the fact that every other mechanic surrounding it is so basic. There is nowhere near enough depth to the overall package to support the mechanic, and thus it feels wasted and underutilised. This is best illustrated by the complete lack of any real strategy that needs to be employed to succeed on the battlefield. Your units and the enemy’s cars all start in the exact same positions for every attempt at a level, and due to how quickly your foe can overwhelm you, the experience turns into a guessing game of working out which way to send your units so that they aren’t destroyed in far too quick a fashion. Because of this, the game feels like more of a puzzle title than one that actually tasks you with employing any amount of strategy. There’s no two ways of completing a level, and if you find yourself in even the tiniest of sticky situations, it’s best to just restart the mission over again because you will eventually fail. There’s no way of fighting back from a bad situation, or conquering the enemy against all odds. Bad Carnage is far too unforgiving, and as a result, any dynamic strategy is impossible to plan and put into action. 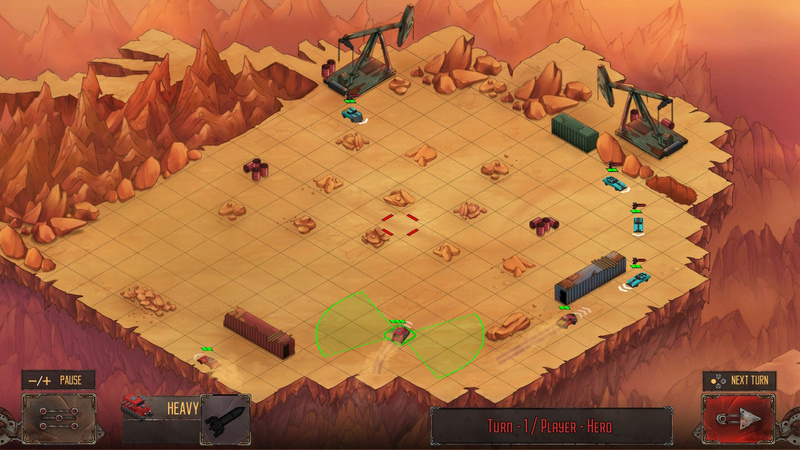 Outside of all this, you’ll be looking to destroy any enemies that fall into your allies’ vision cones. 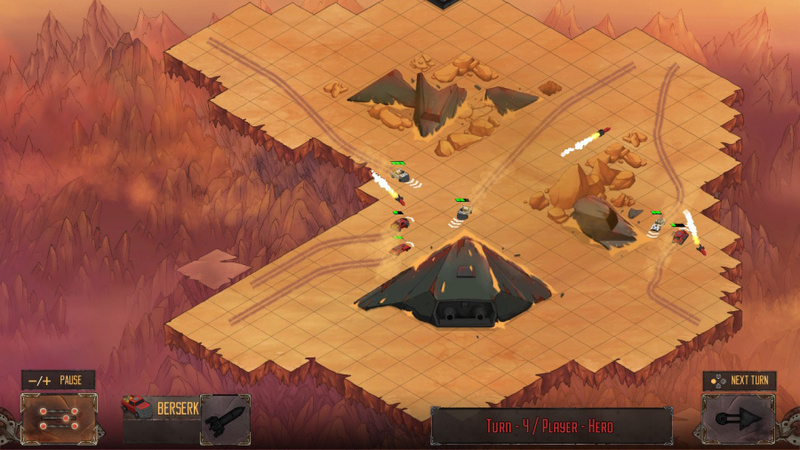 A few different vehicle types help to keep things from going too stale, with the likes of the Fighter model being the speediest of the lot, the Berserk type rams foes off the road, and the Heavy can shoot from either side. 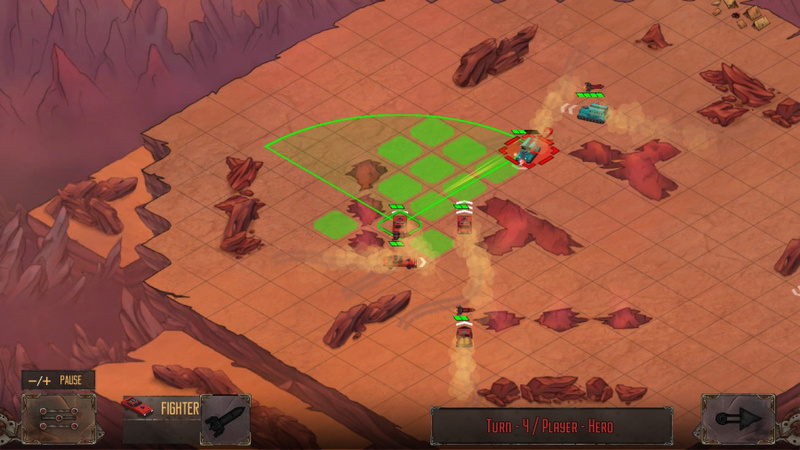 Occasionally, a convoy will come equipped with a rocket that can be deployed over two turns, but in turns of combat variety, that’s your lot. There is a very basic upgrade system that offers enhancements such as increased damage, better mobility, and improved speed, but due to how you have to pick and choose which advancements you install as an overall army rather than by individual units, it never feels like your fleet is improving as a whole. Presentation wise, Mad Carnage doesn’t fare any better. Every level looks far too similar to the other, and due to every area being coated in a bright orange, the colour palette quickly dulls and achieves very little when trying to set any sort of mood or atmosphere. The soundtrack rarely excites either, with simple and monotonous tones failing to convey any sort of emotion. Mad Carnage has a few things going for it in the form of its movement mechanics and the comic strip-led story sections, but they’re packaged together with an experience that doesn’t do them justice. Everything else is far too basic, and thus it fails at building a cohesive experience that we could recommend. @nmanifold Agree on both points. Or "a bit of a lame load." Agreed! That was a great game. I thought it got a little repetitive towards the end, but overall Mad Max was an awesome title. Going after the convoys was my favorite part, felt just like the movie. Darn, I was getting pretty pumped at the beginning of the interview, then it turned out to be pretty lack luster.